Since Malaysia government had changed the rules and regulation for engine conversion, which all Proton cars except Proton Perdana cannot convert to 2.0L engine, the Mitsubishi Lancer GSR 4G93T is one of the highest horsepower turbo engine that can fit into Proton cars (only applicable for those who wish to register their car to JPJ and legally on the road). From the topic, it is clearly shows that this is the first generation 4G93T GSR 1.8L from the Mitsubishi Lancer. There are two types of engine specification throughout the entire life of the Mitsubishi 4G93T first generation engine. There are the normal version which capable to produce approximately 190hp and the 4G93T RS from the wagon also known as Libero in Malaysia here which able to produce approximately 210hp. Below are some of the specification of the GSR 1.8L RS. Here are the normal GSR 4G93T specification. 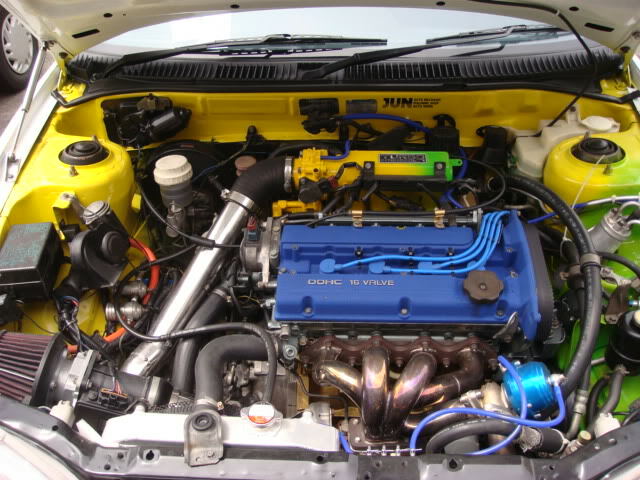 Almost all the GSR in Malaysia are this specification. Conforming to the requirements of the A.P.I. classification "For service SE (or higher)" having a low phosphorous formulation suitable for use in vehicles fitted with catalytic converters and with the correct S.A.E. viscosity grade number for the expected temperature range. Mitsubishi Long Life Coolant at the specified concentration by mixing with demineralised or rainwater only. MASS (Kg). This is only applicable for Lancer. For those who convert this engine to Proton Satria, Proton Saga the weight is different compare to Lancer and Wira. t = Tightening angle method after initial tension to 75 Nm then completely loosened. Specifications so marked were correct at time of publication. If these specifications differ from those on the Vehicle Emission Control Label (in the engine bay) use the specification on the label. NOTE On vehicles fitted with a catalytic converter a blackened exhaust pipe is a normal condition.